The final verdict may yet be out but the trend is quite clear - imperative style is old and busted, functional is the new black; at least as far as “big data” is concerned. This isn’t a book review, though it was prompted by reading the concise and thought-provoking book “Becoming Functional” by Joshua Backfield. Backfield’s book does a good job of introducing functional concepts to imperative programmers and I definitely recommend this quick read to other Java developers considering making the transition. Conversant engineers will find a copy to lend sitting on my desk. I’ve been an imperative style coder for as long as I can remember (and far before I’d ever heard the term ‘imperative’), working almost exclusively in Java since well before Y2K. While I wouldn’t be shocked if over time I grew to find functional code easier to read and clearer in intent, at this point I have a difficult time appreciating what others apparently take as a given. Article after article pronounces functional code as obviously clearer - displaying code as if it’s self-evident that functional trumps imperative on readability. Although this certainly may be true in some - or even many - cases, I don’t find it universally so. The Scala designers think that every keystroke is precious, so they let you combine a class with its primary constructor. When reading a Scala class, you need to disentangle the two. Taken to the extreme, one could argue that a great way to cut down keystrokes - perhaps more than the concise constructor syntax - would be to limit name lengths. Why not keep our method names down to a single character? This is clearly absurd and an unfair comparison as there’s no amount of language knowledge that would provide hints as to the purpose of the method simpy by viewing the API. However, my point is simply that conciseness != readability in every case - especially for the less experienced developer, or those new to a given language. Whereas ten years ago it was rare for a computer science student to get through college without learning recursion and functional programming in one class and C or Pascal with data structures in another class, today it’s possible in many otherwise reputable schools to coast by on Java alone. The ‘issue’ with the iterative solution per Backfield (and other functional evangelists) is the mutable variable ‘total’. Although I’ve been burned innumerable times by side effects, never can I recall something as generally benign as a mutable local counter causing hard-to-diagnose issues. Side effects due to mutability are a real problem - but my experience with these problems is limited to mutable collections with elements being changed, or member variables being updated in a method that doesn’t advertise the fact that it might happen. Fear of mutable method scoped primitives seems irrational to me. And in the example code above I argue the cure is significantly worse than the disease. We’re replacing relatively straightforward iterative code with something that to me (and many I suspect) appears far less clear. This comes with the added benefit of running slower and being less efficient! Ah, but of course in languages like Scala the compiler takes care of replacing this recursion under the covers with what? Iteration! 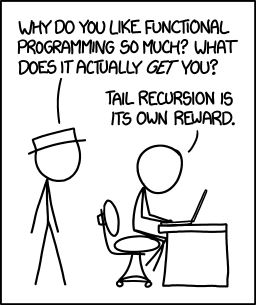 However, you only get the benefit of iterative processing if you know the proper way to structure your tail recursion. Fail at that and you wind up with a bloated stack. Why on earth shouldn’t I just write it iteratively in the first place and save the compiler - and the next maintainer - the trouble? When reading books and articles on functional programming, one can’t help but run across examples including long chains of function calls or multiple levels of nested anonymous functions. You may argue that this really isn’t all that difficult to read - and I’m sure you’re not alone. My complaint however is not about the ability to read, but my ability to read fast. I find when I need to scan multiple lines of code with anonymous functions, I tend to ‘push’ the anonymous functions into my own internal ‘stack’. The longer the chain of calls and the more anonymous functions included, the larger the stack in my head - and the longer it takes to see the intent of the code as I pop each item off. And on this I’m certain that I’m not alone (see Miller’s Law). Add a handful of these constructs into a single section of code and this can significantly slow down troubleshooting, debugging, and code reviews. …and please don’t get me started on currying. So where to go from here? As I said at open, functional is definitely the new coolness in “big data” and we ignore it at our own peril. Many of the tools we’re using today were developed in functional languages like Scala or Clojure. I’m just not ready to commit wholesale to doing things exclusively (or even mostly) the “functional way”. To this end, my team has been dabbling in Scala, writing unit and functional tests using the excellent ScalaTest suite. The more I work with Scala, the more I like it…and the easier it gets to fully grok the Kafka code I frequently find myself digging into. With time perhaps many if not all of my concerns will be proven unfounded - or at least mitigated effectively. Internally we’ll continue to promote efforts to absorb functional concepts and incorporate the best bits into our everyday engineering efforts. Scala has gained significant traction on my team and within the Converesant engineering organization. The plan is to continue to drive this process to discover how far it takes us in becomming more functional. On Becoming Functional was published on July 06, 2015 .